The witness to these encounters, which would like to remain anonymous, submitted multiple videos and photographs of alleged alien encounters. Although the first encounter was originally published without investigation, and was archived on The Black Vault for information purposes, TBV Investigations’ Jeremy Enfinger took over investigation when additional information was submitted by the witness. Below, you will find the breakdown of Jeremy’s investigation. Communication with the witness thus far has been strictly written, mostly via email. I have not yet had the opportunity to have a conversation to discuss witness experiences such as hearing footsteps in his room, his potential abduction experience, or his physical evidence of a surgical procedure. As always, the goals with this kind of investigation is to determine possible alternative explanations for the evidence being presented, which may or may not always corroborate the witness’s experiences, however, it is not necessarily performed in attempt to discredit the witness. Time Gate: This video displays an effect that appears like some flickering lights near the window as initially reported, but also shows the same effect on top of a shelf on the left side of the screen. I have a 4-second clip capturing the anomaly, which I play 6 times at 3 different magnification levels (clip is played twice for each magnification), starting with the full-screen video, and including both the anomaly in the window and the top of the shelf where the effect is seen. You can definitely see a light anomaly in this video over the window. This happens to be originated in the same exact spot in the window that the #5 photo of the alien head in the window can be seen (this will be important to consider when viewing possible explanations of that image). You can also see some pixelation and possible light on the book stand screen left accompanying each pulse of light in the window. 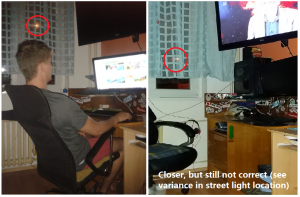 It’s most likely a reflection of the light coming through the window due to the timing in the frames coinciding with the presence and illumination of the window anomaly. 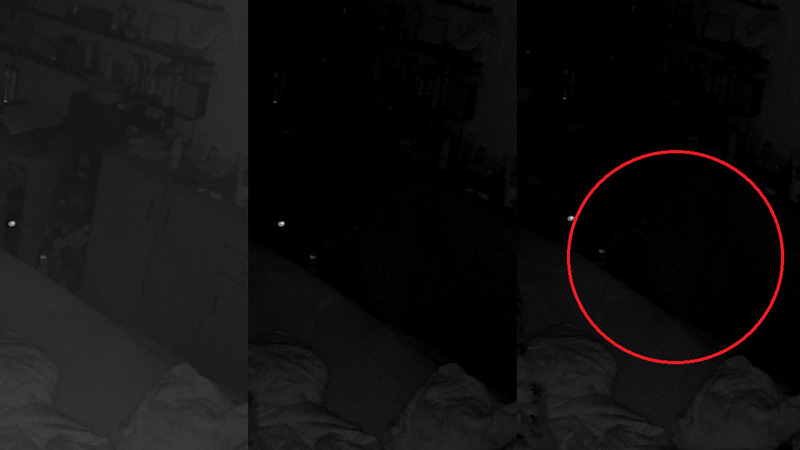 The source appears to be coming from outside the window, as no visible light source was caught within the room, at least within the frame of the video. As future evidence analysis will display, there is a street outside with cars parked on the side, so car headlights, brake lights and/or blinkers could not be ruled out. Photo (blurry) submitted by witness taken from cell phone. 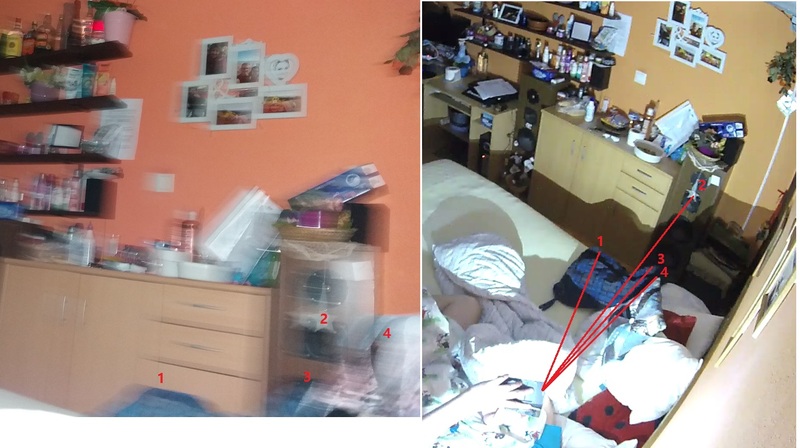 The initial photograph submitted of the grey head beside the bed was incredibly blurry, and video analysis was performed after the initial analysis of the still photo submitted from the witness’s cell phone. A side-by-side comparison of the video angle with the still photo was made. Thankfully, the video displays the moment when the still photo was taken, and the cell phone camera angle could further be evaluated for strength of evidence. Comparison photo of original photo and video angle at the moment the cell photo was exposed (includes flash firing). 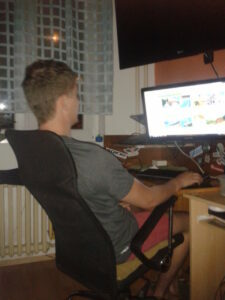 The blurry quality of the photo itself provides little useful evidence. 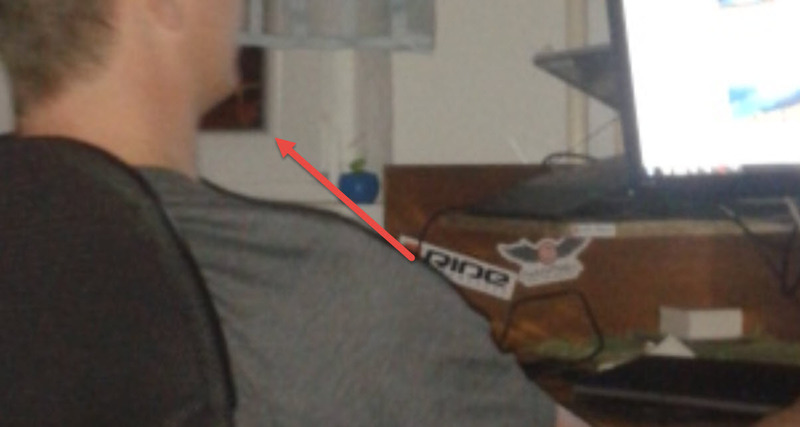 The witness believes the object in the lower-right corner is an alien head. Object #1 looks like the left corner of the blue pillow seen in the video shot (with dresser handles above it and to the right). Object #2 shows the star’s close relationship to the other points 3 and 4. Object #3 is another corner of the same blue pillow. And object #4 (the “alien head”) is the edge of the other pillow with blue, gray and black – colored patterns, which happen to be similar colors when you think of the typical alien grey. 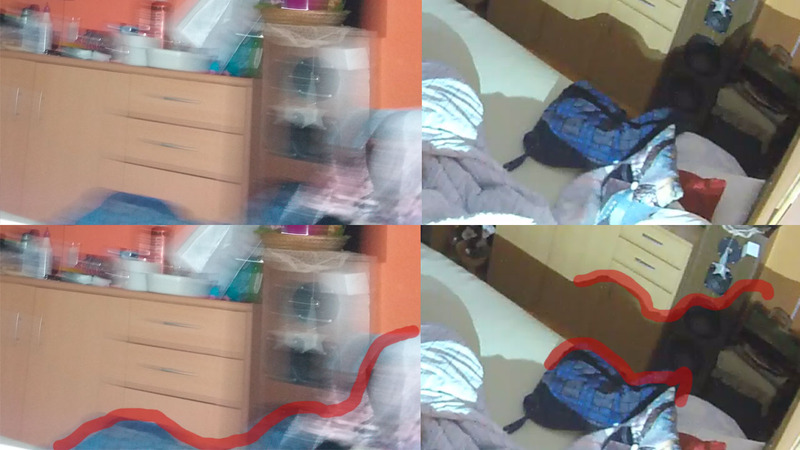 To further corroborate that the blurry image is that of a pillow, you can compare the outline of blurred objects in the foreground of the original image to the shadow outline as seen from the perspective of the video still-shot when the camera flash fired. Even though the angle of the cell phone camera and the video camera vary, the shape similarity between the outline of the pillows themselves and the shadow are significantly similar. Several dust particles are seen in this clip at different regions throughout the frame. 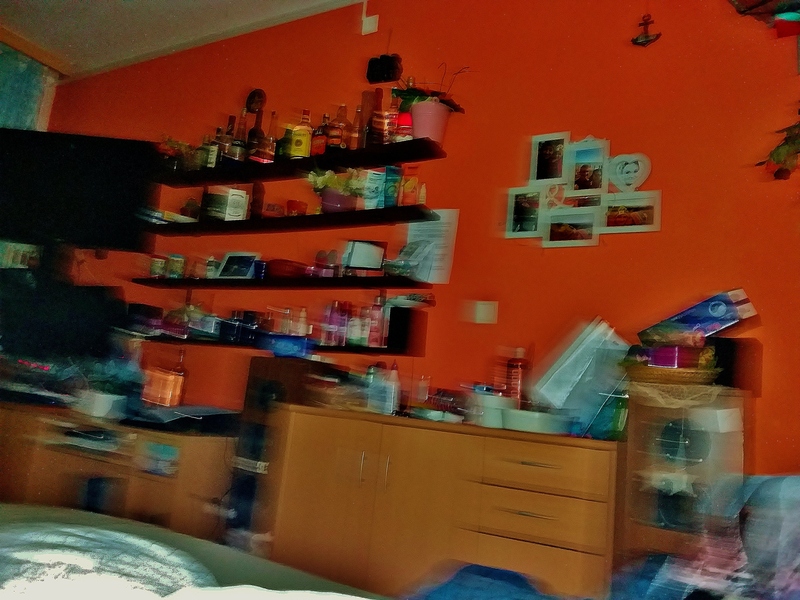 This is a common misnomer for many paranormal investigators who believe they are seeing “orbs” of ghosts, but the visual appearance is caused by the IR light reflecting in dust as it travels through the air in the room. Note the “donut” appearance the dust particle travels in near the end of this clip. Other dust particles prior to this happen to be travelling in a straight line or slight curvature, however, this one seems to make circles and changes directions erratically. Also note that prior to this particular dust particle appears and behaves this way, the witness moves around in bed immediately preceding this. This is another indicator that it is dust, and it could be reacting to slight wind variations in the room, or could have even been ejected from a resting place on a surface in the room, into the air by the witness’s movements. 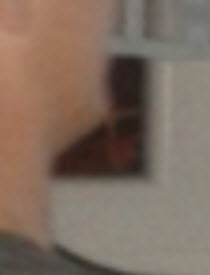 One original array of photographs submitted by the witness, shows a blown up portion of the original photograph, along side typical grey aliens. Original Photograph Submitted… click to enlarge. Enlargement of the “alien head” in the window. The witness provided several of his own photos to analyze this specific picture, however, and while the appearance at first glance resembles the head of an alien grey at face value, other possibilities must be considered. 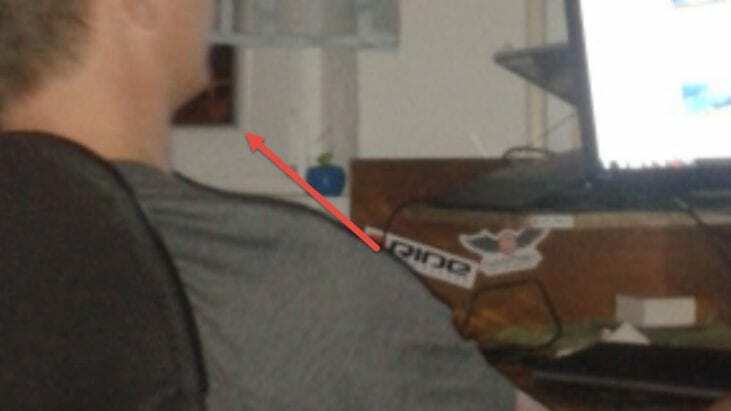 The object does not appear to be a reflection of anything within the room, which was my first thought in considering alternative explanations, and also considering the photo was taken at night, it would make it more difficult to see anything outside, unless there were another light-source outside that would allow visualization in the dark. 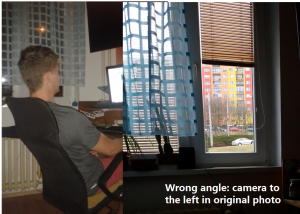 Since no reflective surface could be identified within the room opposite the camera angle to the window, consideration of something outside the window was the next possibility. There are two distinct possibilities I considered. 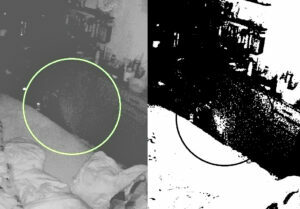 First, the witness was asked to provide several recreation photographs of the camera angle in the original photo. Once several of those were viewed, the witness was then asked for his address. 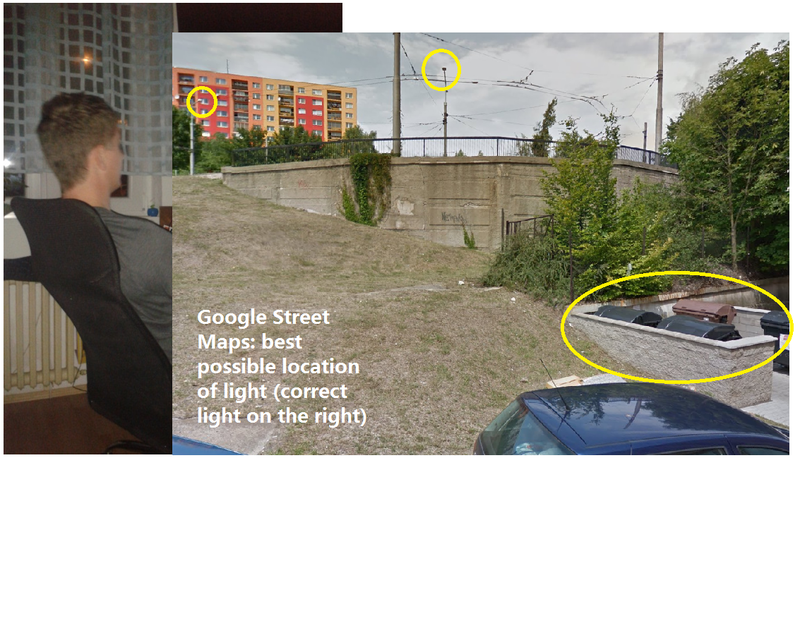 It can be confirmed from Google Maps that the window is on the second story of his apartment building, but more importantly a few other pertinent details like the location of vehicles on the street opposite the window, as well as several street lights that could provide a light source at night to make objects visible through his window. When comparing the zoomed in original photo of the alien head in the window to the recreated photos, it appears that several close, but not exact camera angles were provided. 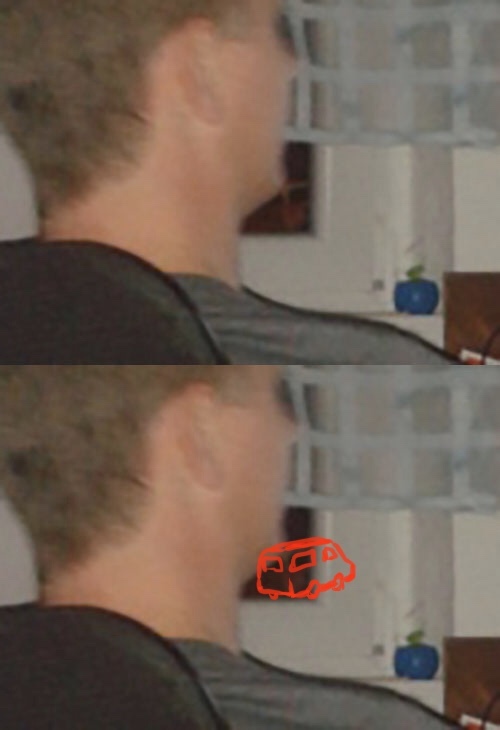 The same van shows up in three of the images, and some different cars do as well. One possibility is the “eyes” of the “alien” could be visually created by windows of a vehicle that is not fully visible within the frame of the window. I was also able to check the google maps link, and there is ample street lighting outside the witness’s flat. While it’s possible the object viewed through the window is either windows of a parked car, you can also see some trash cans surrounded by a low wall. 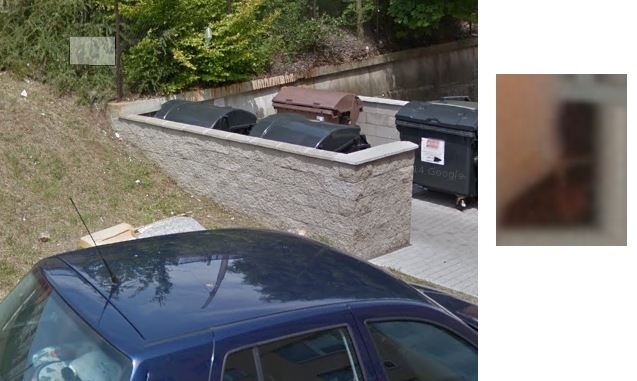 It’s also possible these trash cans could have been rearranged slightly (from the configuration seen in Google Maps) to resemble the alien head. The curved black lids would compose the “alien’s” eyes and the stone wall surrounding the cans could possibly make up the “face”, with the corner making the “nose”. Further analysis of the recreated photos were completed with special attention to the potential light sources available. Details from Google Maps and comparison to the original photo indicated several inconsistent angles in the recreated photos. I believe the angles for the two recreated images above are not accurate. Need to move the camera to the left still. Notice the height of the street lights. 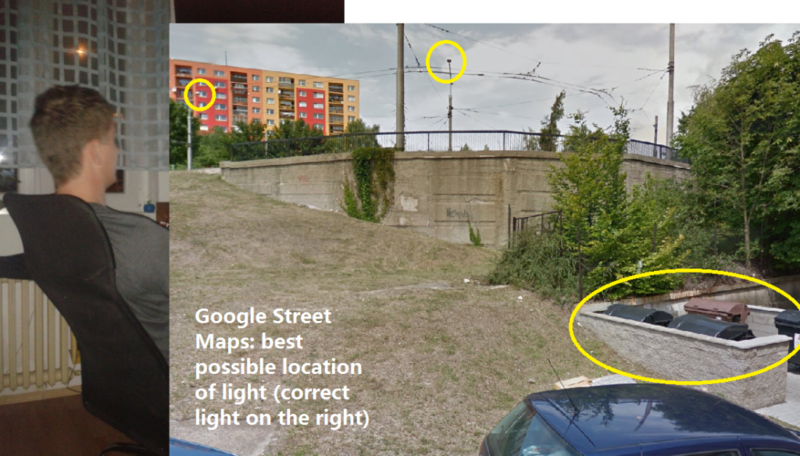 Google Street maps only gave me limited ability to move left/right, but I believe I can demonstrate the street light he shows in his recreations is the wrong one. 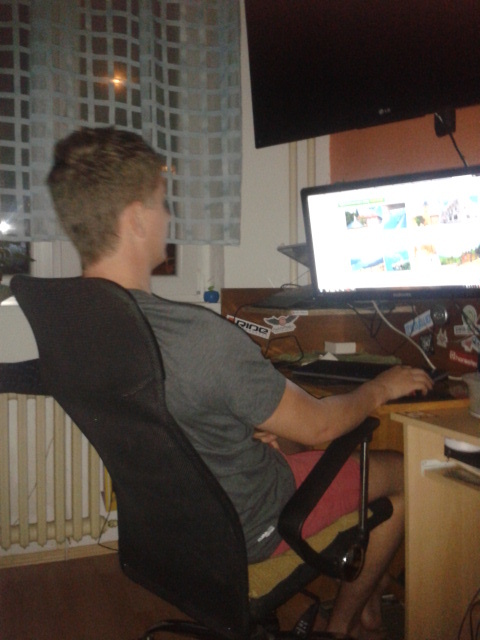 If he moves his camera to the left, you’ll see a taller light (screen right) outside the window and possibly the trash cans that are appearing to look like an alien face. 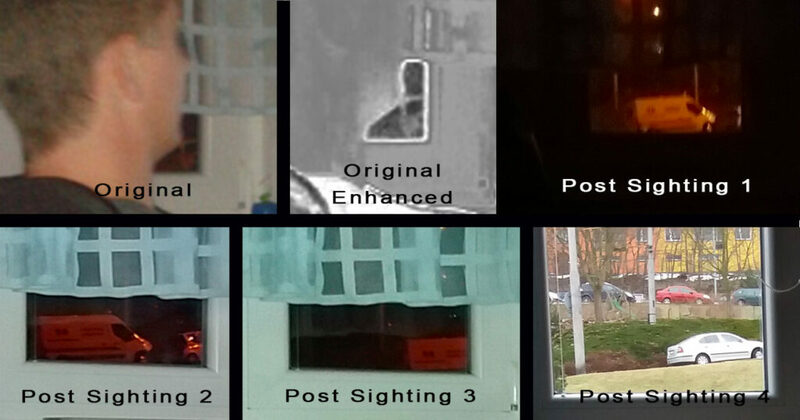 While these confirm the presence of ample lighting required to visualize something through the witness’s window at night, they also allowed for a greater ability to approximate the location of a car or possibly the trash cans outside the window at night, and further validate that the “alien head” could be one of these two things, which are similar in appearance. I was unable to visualize any movement or manifestation of the alien head from any of the videos, so I cannot provide the exact video he believes this shows up in (a total of six clips were submitted). I am posting various screenshots for comparison. A lot of manipulation was needed to visualize anything. The “alien” visualized could possibly be a mottled effect (image graininess) produced by low signal to noise ratio that accompanies low-light images, which is multiplied when attempting to enhance images or change the raw data that was captured. I personally was not able to visualize any distinguishable shapes, so a possible explanation for the witness seeing an alien could be visual matrixing. At some point in the near future, I would like to further this investigation to include an interactive interview regarding the witness’s abduction experience. He maintains that he is not 100% certain that the experience happened, but that some physical effects after the experience served as evidence that something, in face, was done to him on a surgical level. After viewing the possible alternative explanations to the evidence above, I would like to invite the readers to compose their own opinions. Without speaking to the witness first-hand, I would like to reserve my own conclusions until a later time.